Note: January 6, the day of Epiphany, begins a season in the Church calendar also called Epiphany (or Epiphany Season). For a Surprising God article explaining its meaning, click here. Note to preacher: As an introduction, you might show the Visual Bible video enactment of the Magi's visit as recorded in Matthew's Gospel. To find it online, click here (and continue to 10:05). You’ve no doubt heard the story of the three wise men, the Magi, come from the East to visit the newborn Jesus. Some of the ways the story is traditionally told are inaccurate. For example, the Bible does not say how many Magi there were, though it mentions three gifts they brought. Neither does the Bible say anything about these men, except that they were wise and came from the East. It does say they were following a star. As a result, some speculate they were astronomers or astrologers. Others say they were kings. These details are not important, because the story in Matthew is not really about the Magi and their identity, it’s about Jesus and his identity. Matthew’s story of the Magi is traditionally told today, the first Sunday in the season called Epiphany. In the annual worship calendar, presented in the Revised Common Lectionary, Epiphany is both a day (January 6 each year) and a season that begins January 6 (following the 12 days of Christmas) and continues to the first Sunday in Lent (March 10 this year). The word “epiphany” means “revelation” or “manifestation.” Matthew’s account of the Magi’s visit to Jesus is about the manifestation of Jesus to the Gentile world. In this and other stories from the Gospels read during the season of Epiphany, we are reminded of the great truth concerning Jesus’ true identity, which then points to the revelation of God’s true nature. We also are reminded of who we are, in Christ. Note that this event takes place “in the time of King Herod” and also after Jesus had come. The stories of our own lives also fall under this tension of overlapping times. We live “in this present evil time” (under our own “Herods,” if you will) and at the same time, the time after Jesus has come and inaugurated the kingdom of God. This living “between-the-times” presents a tension that we experience as we follow Jesus in this present age. It is thus not surprising that we find ourselves, like the wise men, with many questions. 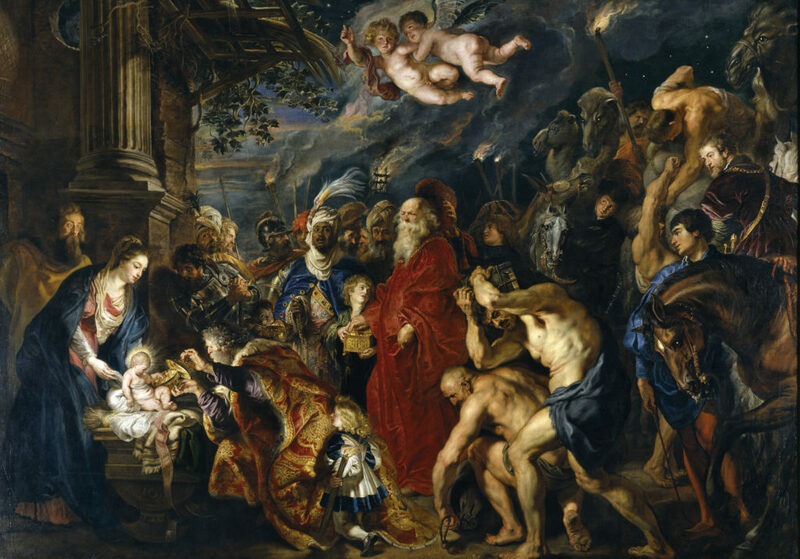 Herod, hiding behind false humility, calculates how to get rid of this newborn king. In doing so, he inadvertently provides to the Magi a hearing of the Jewish scriptures. In case we think this story tells us that all roads lead to Jesus, these Gentile travelers do not find Jesus until after a hearing of the words “written by the prophet.” It is only after that hearing that they find the answer to Jesus’ location. God will walk down any road we are on, and he can get our attention using things like astrology, mythology, science or nature, but in the end, he brings us to know him through his word. That understanding brings us to an epiphany from our story: God calls everyone to himself. He did not choose the Jews to exclude the rest of the nations. He chose them as a way to include the whole world. The appearance of the Magi signals that all are welcome in Jesus’ kingdom. When they arrived in Bethlehem, the star they followed “stopped” and they “were overwhelmed with joy.” In our search for Jesus, sooner or later the signs that point to him are replaced with the joy that he is near. Joy becomes our new guide, leading us to enter his home where we see Jesus. When the Magi enter the house, they not only see Jesus, but see him “with Mary his mother.” This is another epiphany: God is a God of relationship. Jesus doesn’t drop out of the sky like Thor or an alien invader. He comes to us in relationship, where our identity is wrapped up in who we are with him. It is in this relational context that true worship takes place. The wise men don’t worship outside the stable. No matter how dirty it may be inside, worship takes place alongside brothers and sisters who come to “pay homage,” sharing all they have with Jesus. The question they haven’t asked has been answered. Who is this new king? He is King of kings and Lord of lords—the Lord God himself, who has humbled himself so as to exalt us in relationship with him. Like the wise men, this revelation brings forth repentance. We turn our ears from the rulers of this age and set our sights on following Jesus. Home is now found down a different road. This is a story about the Magi who came from the East. What are some of the myths of this story that might get in the way of what their visit is really about? What kind of questions do we wrestle with as we live in the tension between the present evil time and knowing that Jesus has already arrived with his kingdom? How might we participate with Jesus meeting people on their journey while bringing them to know him face-to-face? What role does Scripture play in sharing Jesus? Do you see other epiphanies in the story of the Magi? What do the details of worship seen in the story tell us about our worship of God? Read Isaiah 60:1-5 and discuss how it relates to the story of the Magi. Do you see a correlation between Psalm 72:1-7, 10-14 and the story of the Magi? Discuss what it meant for these wise men to come to Jesus. Read Ephesians 3:1-12 where Paul shares that he was called to bring light to the Gentiles, helping them understand they are included. Discuss how the story of the Magi also makes this clear. Thanks for the insight into the message- ‘A Light To Follow ‘ It calls for deep meditation and study.